The Ocean at the End of the Lane by Neil Gaiman | Blah! A boy lives in the country side with his parents and little sister, a typical family. They live a quiet, peaceful life. That is, until the boy becomes friends with the girl, Lettie, at the end of the lane, a girl whose family is anything but typical. 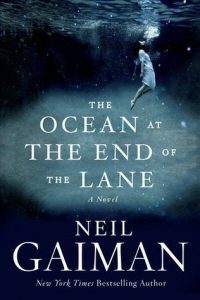 The Ocean at the End of the Lane is another marvelous story by Neil Gaiman. He effortlessly weaves the almost mundane rural life of a little boy with cosmic events and characters that boggle imagination. While we never really learn more than the boy does about the cosmos beyond the glimpses he gets through his friendship with his neighbor, Gaiman teases a vast and complex world in which there are many forces struggling for control, for dominion. The boy’s struggles, all too threatening to his life, are mirrored against those of almost a planetary scale, with the nature of reality in the balance. Never are the boy’s struggles minimized but there is always the threat of something even bigger coming, with the power to destroy not only the boy, but everything. As has been said, any science advanced enough will appear like magic to those unfamiliar with it. Thus, Lettie and her mother and grandmother don’t practice magic, per se, but talk about neutrons and electrons and come across as knowing more about how the world works than average people, though this is only briefly touched on, teased so to speak. Some of the characters Gaiman introduces are only given a brief introduction, even if they are all important to the story. This story left me wanting to know more, about the history of these characters and their future stories. Hopefully, this is a world that Gaiman revisits in a future book.